Amazon has made its Channels SVOD partners program a big success by applying its considerable marketing muscle. However, the eTailer is benefiting from Channels more than its partners are. Amazon resells many SVOD services to its more than 100 million Prime customers through its Channels program. With three-quarters of Prime members using the video service, most are accustomed to using Amazon to find and watch video. However, Amazon’s reach is even more significant than that. 18% of the US population use Amazon to rent or purchase videos. Each one of these visits is an opportunity to sell people SVOD subscriptions. Such a considerable marketing muscle has helped SVOD providers that partner with Amazon acquire many new customers. CBS’ CEO said recently, “Amazon has been absolutely amazing in terms of growing our subs.” Some, behind closed doors, say Amazon is contributing as many as half of the subscribers to their services. According to the new free nScreenMedia report sponsored by Vindicia Keep My Customer – Why consumers subscribe to, stay with, cancel, and come back to online video services, Amazon Channels is a big success. One-third of our survey respondents who subscribe to Amazon Prime Video has purchased an add-on video service in the US. In the US, the most popular video add-ons are premium video services like HBO, Starz, Showtime, and Cinemax. CBS All Access is also very popular. In the UK, the story is the same. A third of Amazon Prime Video users say they have an add-on video service. 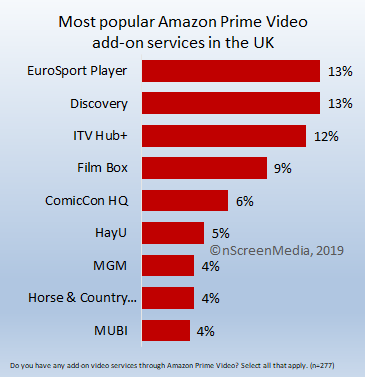 The most popular are Eurosport Player and Discovery. ITV Hub+ and FilmBox are also very popular. Amazon is benefiting in another way from its Amazon Channels program. Higher income individuals are more likely to use Amazon Prime Video and to subscribe to another video service through it. In the US, 58% of those earning $50,000 or more subscribe to Amazon Prime Video, 45% earning less than this subscribe. In the UK, 64% of those earning £45,000 or more subscribe to Amazon Prime Video, 52% earning less than this subscribe. While this slant toward upper earners does not benefit Amazon’s video partners, it certainly does benefit Amazon. Higher earners are more likely to spend more in Amazon’s retail store. In the broader context of the SVOD market, Amazon Channels is a long way from dominating distribution. However, for smaller services it is fast becoming an essential part of a successful distribution strategy. 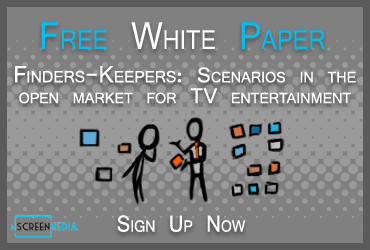 To understand much more about consumer behaviors with SVOD services, you should download the free report Keep My Customers now.